What Christmas Eve traditions do you have in your family? Putting out a mince pie and a glass of milk (or sherry!) for Santa and a carrot for the reindeer is a common one. Many parents have also made the discovery that the excitement of Christmas Eve can be somewhat curbed (enough to get the kids to sleep) if they allow them to open one present before they go to bed. This has evolved into the tradition of giving Christmas Eve boxes to kids on the night before Xmas – a box containing treats such as Christmas pyjamas (so they’ll look great in the xmas morning photos! ), cosy socks or slippers, hot chocolate, a Christmas DVD to keep them busy while you’re wrapping presents and preparing food, and other small gifts to help them wind down before the big day. 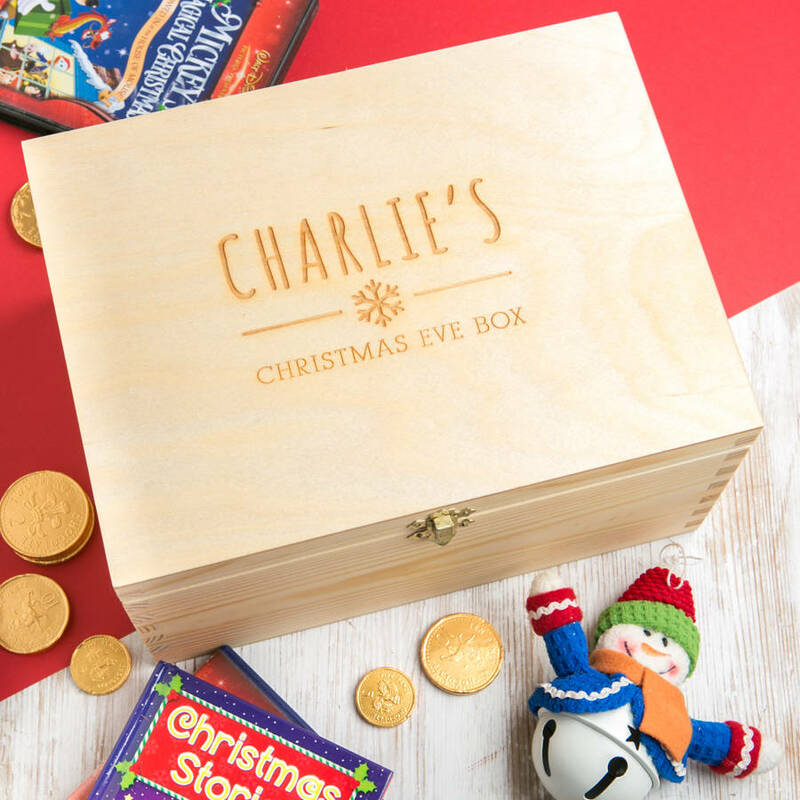 You can use any cardboard box but a nice quality wooden box like this personalised children’s Christmas Eve box can be put away and brought out every year and it makes the tradition that little bit more special. 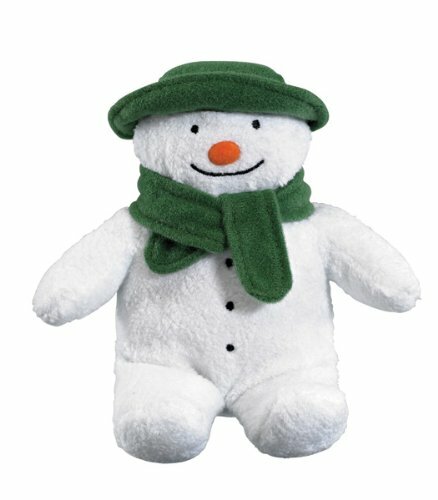 As well as being engraved with your child’s name you can also choose up to four different symbols depending on your child’s interests including snowflake, Santa, Rudolf, penguin, lego, dinosaur, teddy and more. You can also add a secret special message engraving on the bottom of the box. Available from Not On The High Street. Of course the goodies don’t have to go in a box – a bag works just as well and is cheaper if you’re on a tight budget. 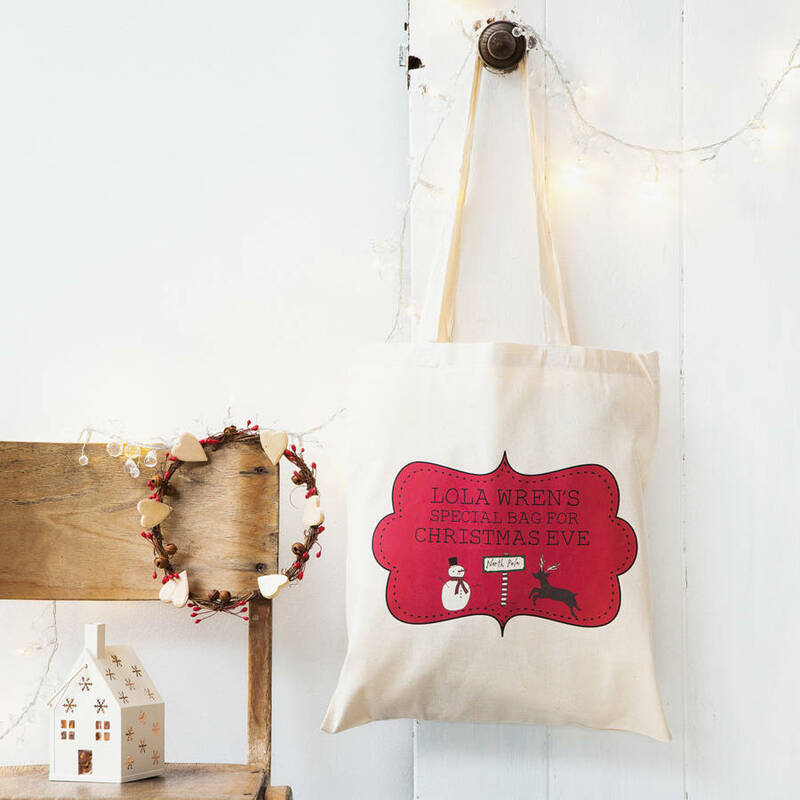 These personalised Christmas Eve bags are lovely, big enough to hold plenty of treats, and can be hung up on a door handle like a stocking. Order with your child’s name from Not On The High Street. 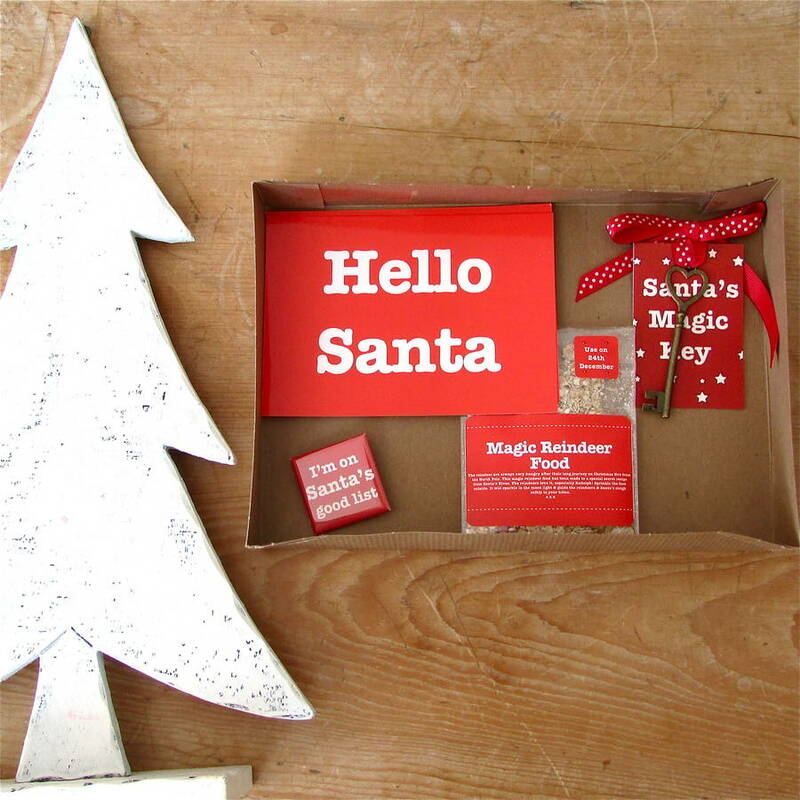 If you’re short on time you can get a box that’s already been put together like this Christmas Eve kit that contains reindeer food, Santa’s magic key, Christmas badges, and “Hellos Santa” postcards for the kids to draw on or write a letter to Santa. Get it from Not On The High Street. A new pair of pyjamas are a must for any Christmas Eve box! Getting changed into pyjamas is a good way of getting your kids to start winding down for their bedtime routine and they’ll look great for photos on Christmas morning! 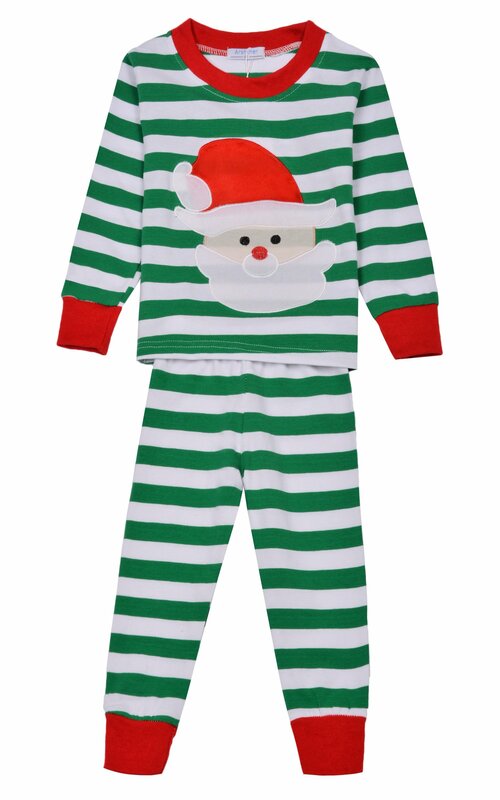 There are so many lovely Xmas pyjamas available this year – I like these unisex striped pyjamas. Keep those little feet cosy with some festive slippers or socks! 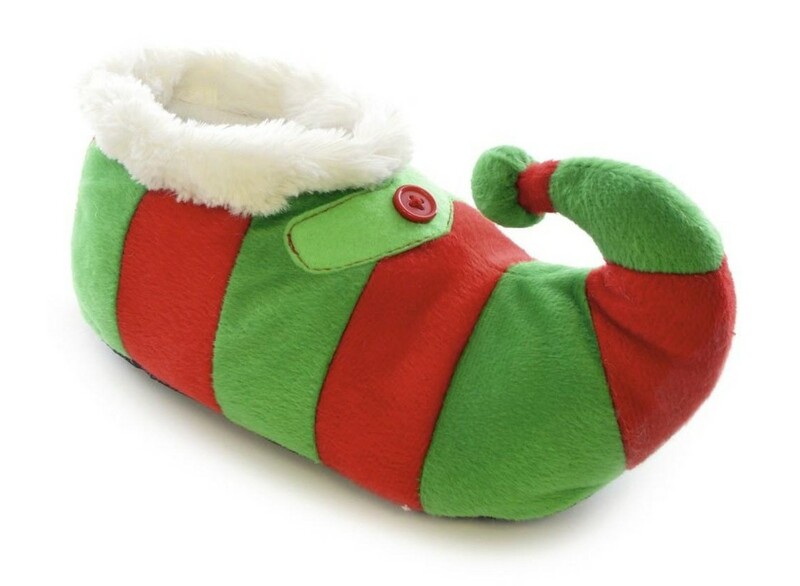 These novelty elf slippers are great for both boys and girls. This gorgeous olive-wood board provides the perfect setting to put out treats for Santa and his reindeer on Christmas Eve. 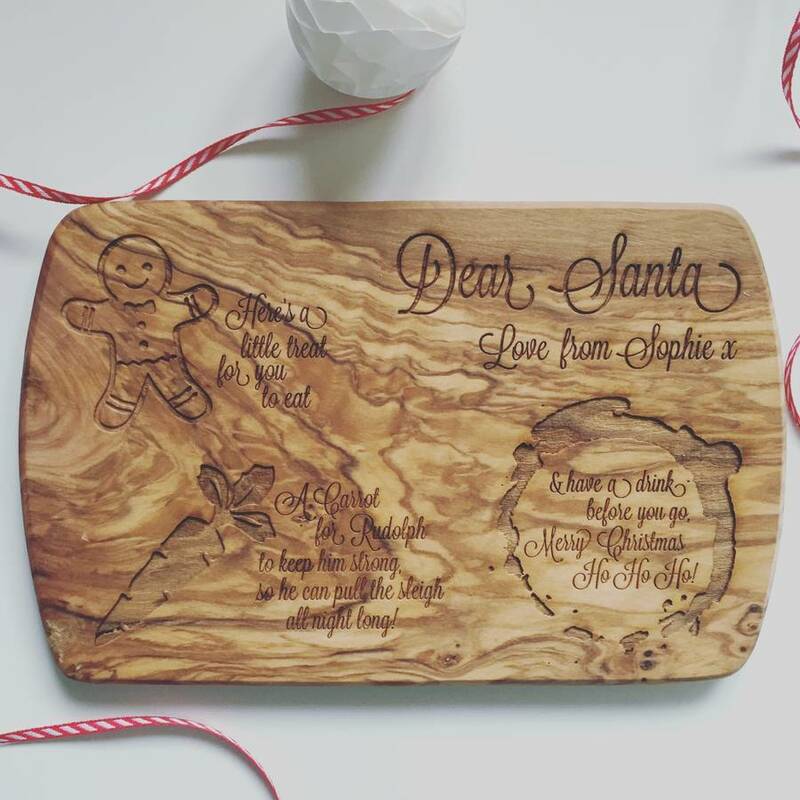 It can be personalised with the name of your child and their are places etched in the wood for a Christmas cookie or gingerbread man, a carrot for Rudolph and a drink for Santa (alcoholic or non-alcoholic as per your preference!). It really is a beautiful piece that you will enjoy using for this Christmas tradition year after year. Available from Not On The High Street. 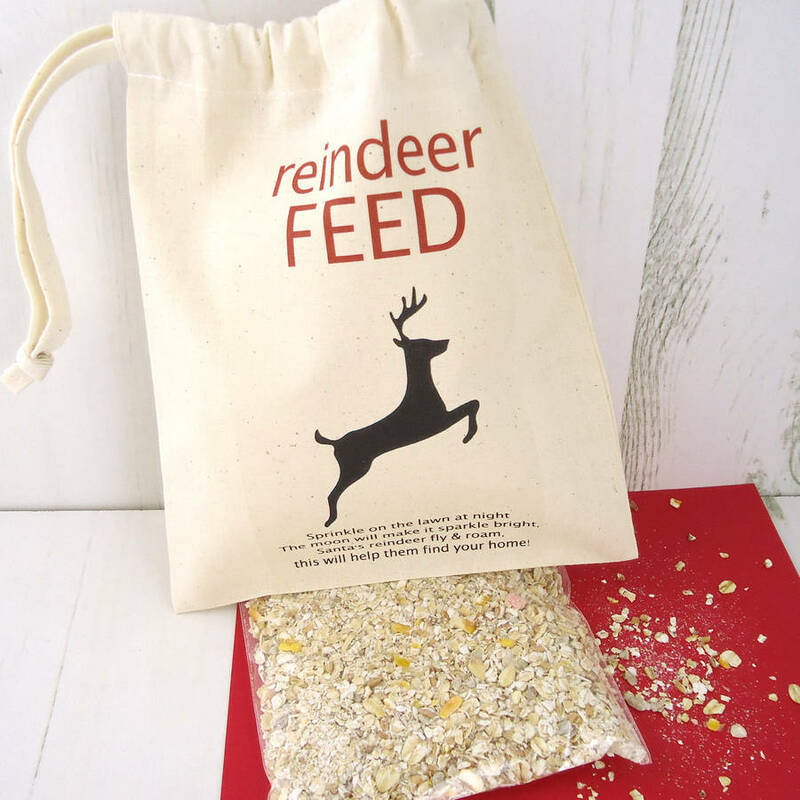 This sparkly reindeer food comes in a lovely cotton bag and is safe for birds or kids if it gets accidentally eaten! Sprinkle it on the ground outside and it will shimmer and sparkle so the reindeer can see their way to your house. Get it from Not On The High Street. A Christmas-themed activity book, colouring book or puzzles are great ways to keep your kids busy on Christmas Eve so you can get on with preparing for the big day without interruptions. 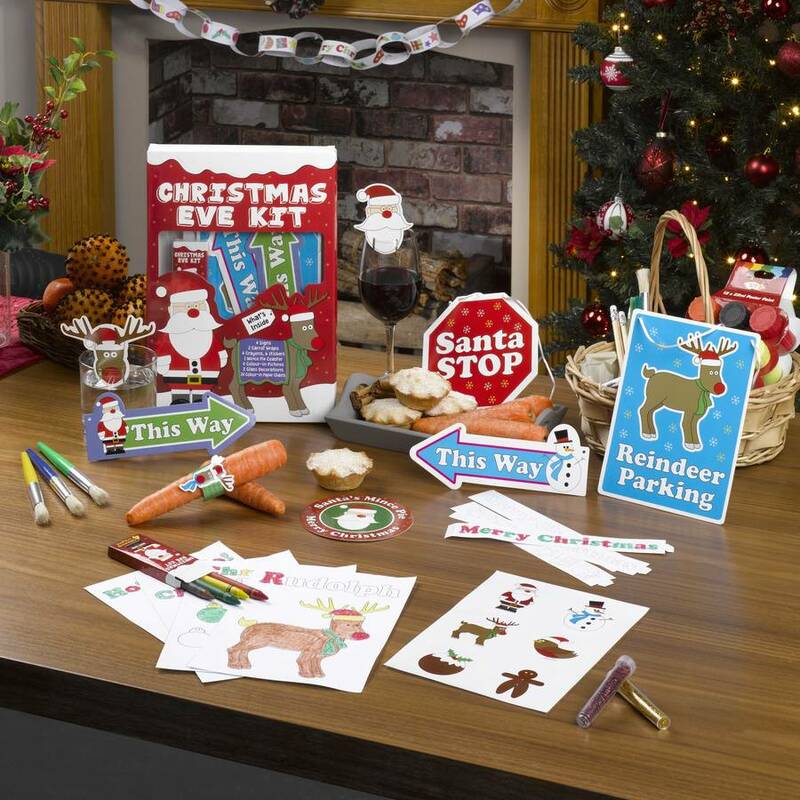 This kit includes colouring pictures, crayons, stickers, fun signs to stick up, glass decorations, carrot wraps and a mince pie coaster, colour-in paper chains and glitter. Available from Not On The High Street. 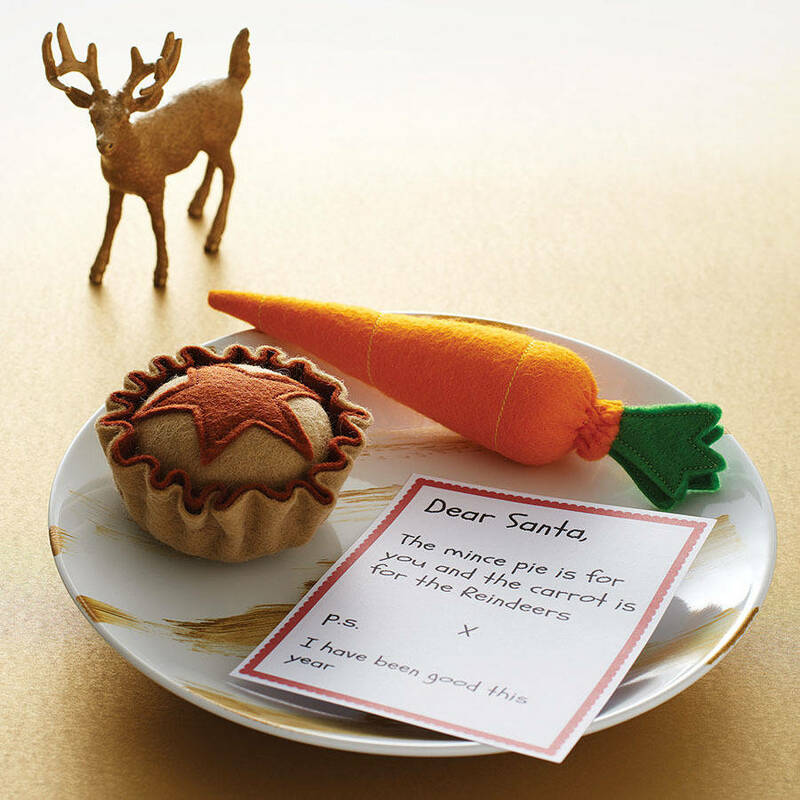 This cute little play food set includes a mince pie, a carrot and a note for Santa so your kids can play Christmas whenever they like (I know mine are still playing Halloween!) It makes a lovely stocking filler or Christmas Eve box gift. Available from Not On The High Street. 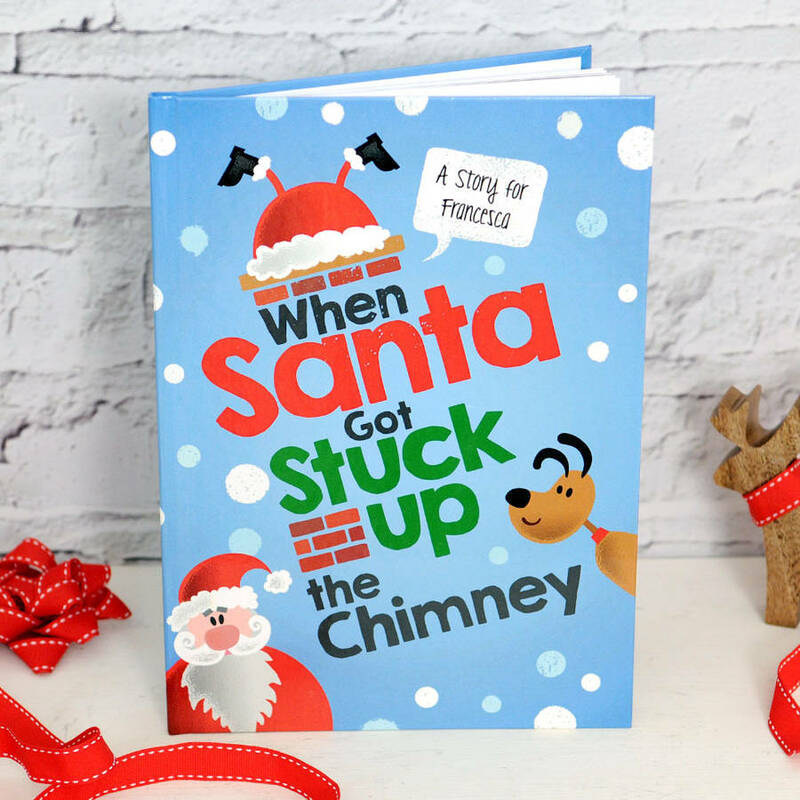 A Christmassy picture book is always a lovely thing to include in a Xmas Eve box and this personalised When Santa Got Stuck Up The Chimney book is extra special as your child’s name will appear throughout the book alongside lovely illustrations and an amusing rhyming tale about Santa. Order it from Not On The High Street. 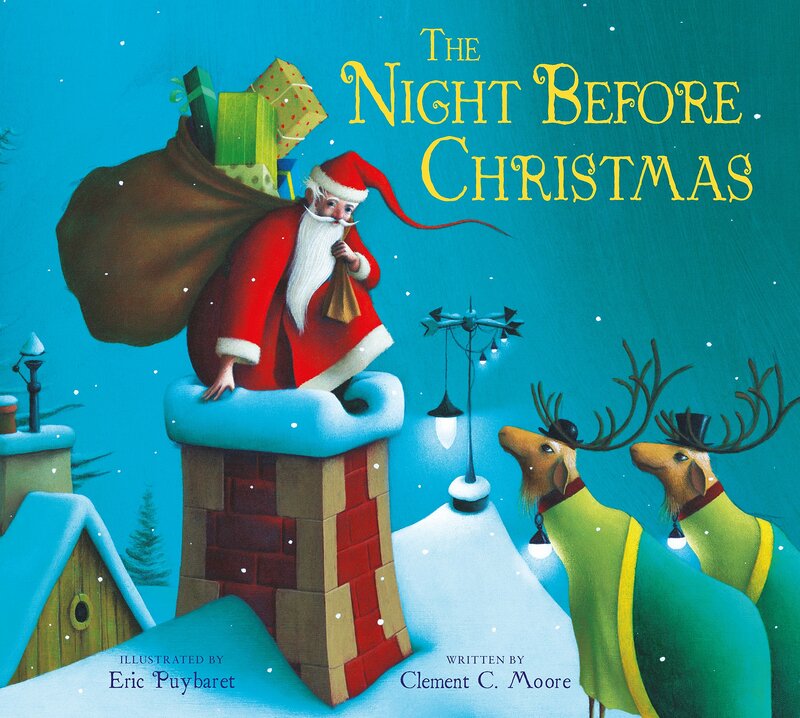 The Night Before Christmas is also a Christmas classic and this beautifully illustrated version will be enjoyed by children of all ages on Xmas Eve. 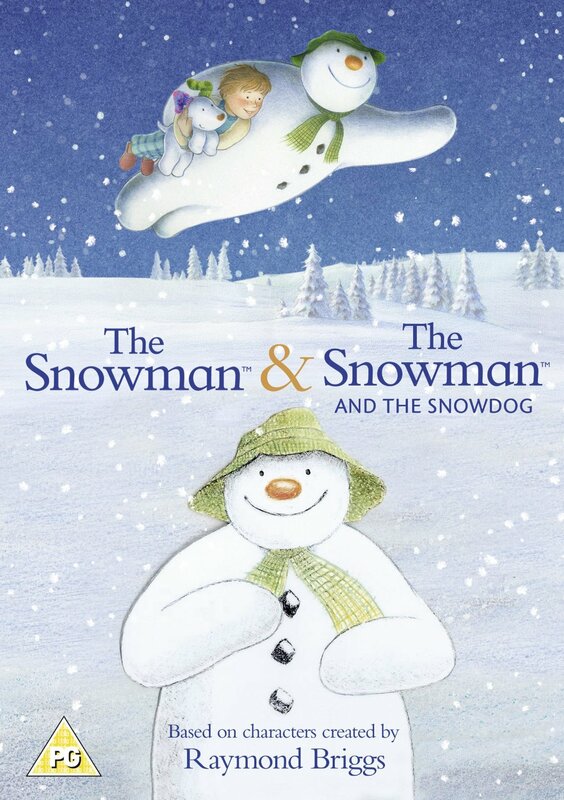 The Snowman is a timeless Christmas classic and as it’s without dialogue and just has the beautiful accompaniment of classical music, it’s a lovely calming movie to watch at bedtime on Christmas Eve. 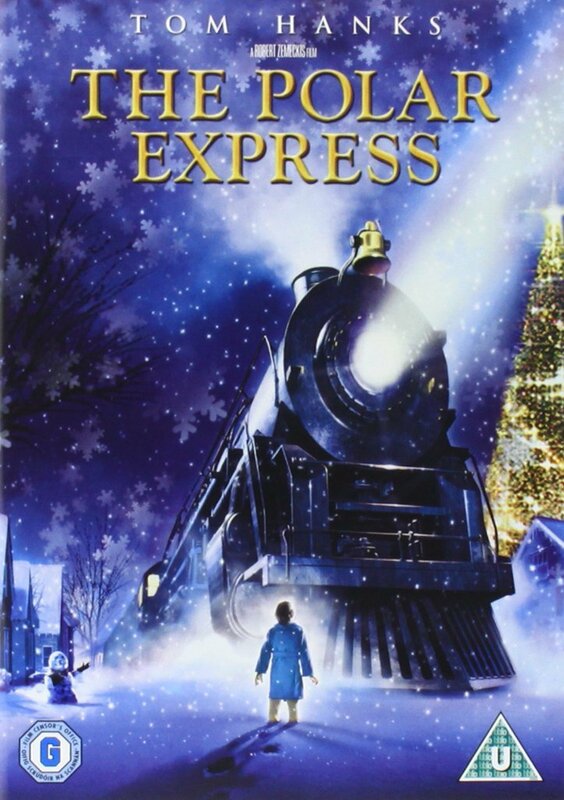 The Polar Express is another movie that my kids love to watch and really gets you in the mood for Christmas. Hot Chocolate is a must on Christmas Eve! 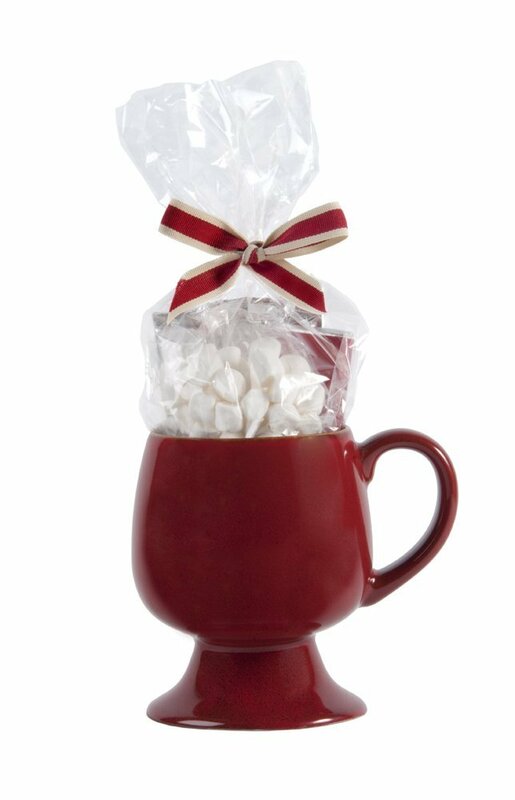 You could just include a sachet of drinking chocolate or to make it extra special, a gift mug like this festive red one that includes hot chocolate and marshmallows is lovely. Most modern houses don’t have chimneys and many children are concerned that Santa won’t be able to get into their house without one! 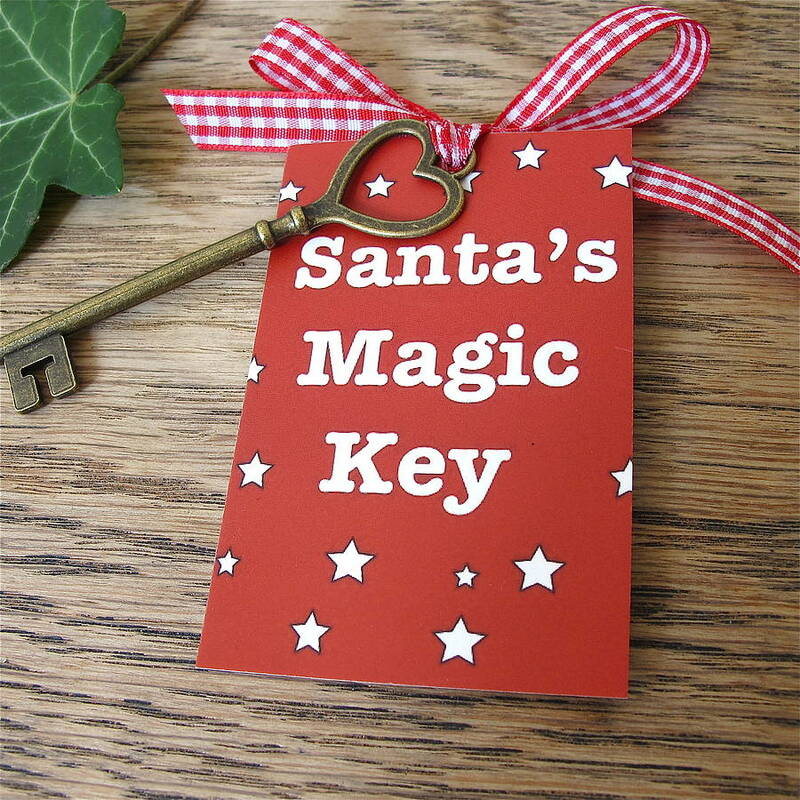 This is where Santa’s magic key comes in – Santa can use this special key only on Xmas Eve with magic from the North Pole to deliver your presents! This lovely big vintage-style key has a card with instructions for use attached with a gingham ribbon. Order from Not On The High Street. A nice warm bath is a great way to relax your kids before they go to bed on Christmas Eve. 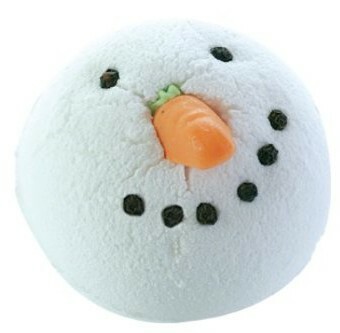 They will love this snowman bath bomb that fizzes and turns the bath water white, filling it with a Christmassy scent.